The major scale has a distinctive sound, thanks to its sequence of intervals: tone, tone, semitone, tone, tone, tone, semitone (TTSTTTS). When the major scale starts from a different note, the order of these intervals changes and produces seven new scales, called 'modes'. Each mode has its own distinctive mood. The best way to get a feel for each mode is to compare the different intervals that each starting point produces. The Ionian mode is the same as the major scale and has the intervals: 1 2 3 4 5 6 7. All other modes and their intervals are compared to it. Modes with a major 3rd (marked '3') are major and are generally happy-sounding. Modes with a minor 3rd (with a 'b3') are minor and have a generally dark sound. 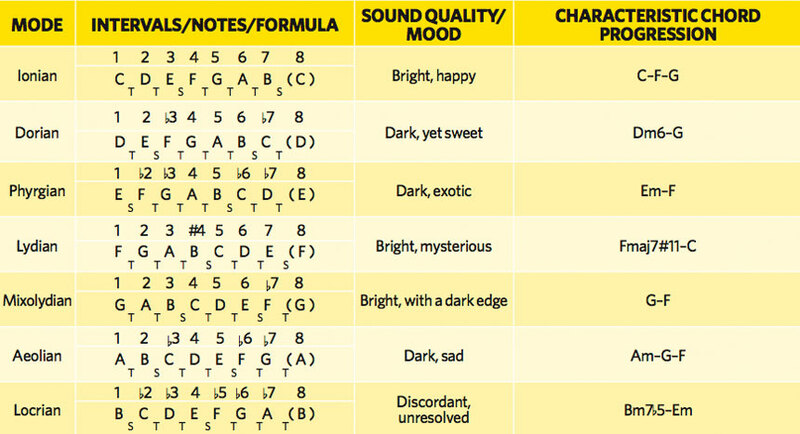 The table above tells you all you need to know about the modes derived from the C major scale. Click here for a larger version of our mode chart (below). 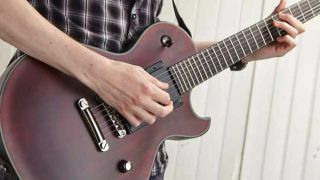 Try the tabbed licks below to get a feel for modal lead. The licks are identical, except that each begins a step farther up the C major scale to ensure it is a mode. Because the major scale is so common, it is rarely referred to as the Ionian mode. Its bright, happy sound is great for upbeat tracks and soaring melodies. Dorian is a minor-sounding mode, but it has a brighter sound than other minor scales and modes (thanks to its major 6th) and is used a lot in blues and jazz. Phrygian is a minor-sounding mode that has a distinctly exotic, some say Spanish, sound. Its dark sound means that it is used a lot in heavy metal. Lydian is a major-sounding mode that has an exotic sound that is used a lot in jazz and instrumental rock as a substitute for the, often dull, major scale. Mixolydian is a major-sounding mode that is used a lot in rock and country music. It is mixed frequently with major pentatonic licks. Also known as the natural minor scale, the Aeolian is a minor-sounding mode with a dark, sad sound. Early hard rock and metal was based heavily on the Aeolian mode. The Locrian mode is the least common of the modes, as its root chord is the discordant m7 b 5. However, it is used occasionally in heavy metal and fusion.